The late Elie Schalit, shipping magnate, philanthropist, and a founder of the fledging State of Israel’s arms industry, had a life-long fascination with Christopher Columbus (Colon), both as a navigator and possibly of Jewish descent. Mr. Schalit invested much effort and money to commission museum-quality replicas of Columbus’s books, diaries, and navigational tools created by Jews and Conversos. The exhibit premiered in 1992 in Madrid on the 500th anniversary of the Expulsion from Spain. King Juan Carlos and Queen Sophia presided over the opening gala. Elie and Ana Schalit donated the entire Columbus Exhibit to Netanya Academic College in 2012, intending it to be a cornerstone of the future Sefardi and Anousim museum to be established at Netanya Academic College. We look forward to honoring his request soon. The planned Sefarad Museum, a multi-million dollar, 16,500 sq. 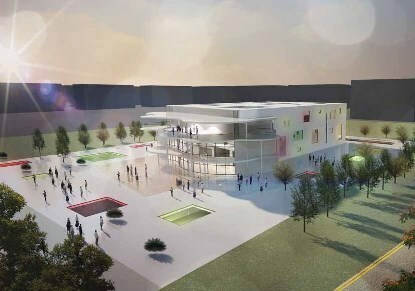 ft. project of the City of Netanya, the Netanya Foundation, and Netanya Academic College, will be built adjacent to the Netanya Academic College campus. The Museum’s mission is to promote awareness of the rich Iberian Jewish heritage, before and after the Expulsion. Aside from the acquisition and conservation of artifacts, books, and archival assets, and research and education areas, the Museum will have special wings, including the Elie Schalit Columbus exhibition displays. Our resource library will include special collections, including the personal library of the late Prof. Benzion Netanyahu, to be dedicated to his achievements, and the Gloria and Leslie Mound Memorial Library. The Sefarad Museum intends to be a world center for Sefardim and Anousim, dedicated to building Jewish identity through a profound sense of community and appreciation of the contributions of Sefardim to Jewish and world culture. For more information, please see the Sefarad Museum website.